I recently saw Mockingjay Part II with some friends, and based off some comments they made and some thoughts I'd had, I wanted to discuss things I wish had been changed in the movie. Warning: this post will be laden with spoilers for Mockingjay. Read at your own peril. What were those things? There were mutts in The Hunger Games, with eyes that were meant to have been from the previous tributes. I don't remember what exactly the mutts looked like, but they definitely did not look like what was featured in Mockingjay Part II. It was like we'd been suddenly immersed in a first-person shooter game, with zombies. Maybe the mutts were intentionally made as zombies? But the continuity feels so strange from the first movie. My friends really liked the video game feel and felt that added to the tension; I was less a fan. They also didn't understand that the mutts were saying Katniss over and over, and that's part of why everyone was freaked out and ready to leave ASAP. I don't really know what could've helped with that aside from reading the book or having super attuned ears, but the look of the mutts confused all three of us. Were they changed in the book too? One of y'all will have to let me know. Okay, there are some details that just confused us. For instance, when Katniss and Gale leave Tigris's place, why don't they try to disguise their faces as well? One of my friends had also read the book, and said that that had been changed - they had disguised themselves in the novel. My theory for why they hadn't was that if they had been disguised, there would've been no reason for Katniss and Gale to panic as much as they had about the Peacekeepers checking people. But if that's the case, that just feels transparent to me. I don't really know what was going on there. And why would the Capitol use a rocket launcher to destroy the building Katniss, Peeta, Finnick, and co. were supposedly in, after Boggs died? That seemed extraordinarily silly. Was that in the book too? Why would they use something that would destroy most means of identifying Katniss's body? I thought that might've been a part of the propaganda - show the entire building being destroyed. But then the Capitol could've edited the video to take out the part when the Peacekeepers enter the building to see who's actually there before destroying it. Again that seemed conveniently stupid. Same with this last scene: Finnick's death. Maybe I'm late to this conversation, and this happened in the book too, but was Finnick the last one to climb the ladder? If Katniss was watching, why didn't she throw her bow or get someone else to throw something as Finnick was climbing? At that moment, I knew that Finnick wasn't going to live, but watching it felt like an injustice; it seemed, again, like it had been manufactured for our sympathy when a simple action could've been taken to prevent any of the mutts from jumping so high and swiping at Finnick (i.e. that bow or something else would've knocked them straight in the face). If it was more than one which had jumped or if Katniss had lost her bow or if she was smiling like she never saw it coming, I might've felt less skeptical of that scene. And finally, what was the deal with the tarlike goo? Was that in the book too? I was seriously holding my laughter in because I was reminded of Spiderman and his arch-nemesis in that silver spider suit, especially when the one person who was killed was wrapped in a web high above the ground by whatever substance that was. It seems callous to say, and the special effects for that scene were really, really cool, but I'm still baffled. Most of my comments seem to be: wait, was that in the book too?! On that note, something my friends missed: Peeta saving Katniss by making sure that she couldn't take nightlock after killing Coin. To be fair to the movie, one of my friends said that she was distracted by how nice his coat was (so excellent job, costume team!). At the same time, I do wonder how much someone who hadn't read the books understood from these movies? !!! I wish that there'd been greater focus on the fact that Paylor, a black female, became president of Panem. One of my friends -- not the two I saw the movie with but someone else -- once pointed out how in Catching Fire and The Hunger Games, the movie seemed to have all black people protesting in District 11 (Rue and Thresh were black, but that doesn't mean that the entire district would be -- unless the director intended it that way?). So then does that mean the districts are segregated by race (because the same image isn't really seen in the other districts too)? Maybe I'm making too much of this, and that was a detail that had unintended implications, but I'm curious about which details could be seen as futuristic commentary. On that note, somehow Finnick and Annie seemed to have a Christian wedding? Maybe I misunderstood that scene, but it looked like they were married by a priest, not just someone officiating, and Annie was dressed in the veil and a white gown and so on and so forth. Maybe it's my own prejudice for assuming that's a Christian wedding (the words seemed similar and the position of the person officiating and the fact that they're in the "traditional" Western outfits), but this also made me want to scratch my head. So in the post-apocalyptic future, when we've got extreme advances in medicine and science, we also still keep very "traditional" elements like the white wedding gown and this kind of wedding? I also started to wonder whether that was futuristic commentary. 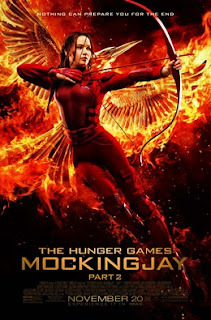 At the same time, this Mockingjay film felt like it'd been suddenly sanitized. In Part I, Katniss is very clearly recovering from the trauma of THG and Catching Fire - her "My name is Katniss Everdeen" etc. repetition is meant to show that, plus all the extra scenes devoted to that story line. In Part II, I can name on my hand the scenes that focused on Katniss's PTSD and trauma (screaming at the cat, Tigris's basement after Finnick, sleeping on the couch in Victor's Circle, and the beginning with Peeta) She has some scenes where she's discussing the horror of war (before she gets shot in District 2, the bombs with Gale, etc. ), but that's not the same as the effects of war lingering within her. They don't really even go over the fact that Plutarch uses her trauma as an excuse for why she killed Coin (instead it's that it fits within her character??). That seemed weird to me, particularly since this movie was about WAR and its effects (why not discuss her PTSD?). But that was kind of what happened with this movie in general. My biggest disappointment was the fact that there were few scenes devoted to the emotionally intense consequences. How many people died and how many minutes were spent afterward on their deaths? Maybe that's a commentary too on war, but it felt more like the movie sacrificed the emotional intensity for action, action, action. Prim, Finnick, Boggs, Jackson and co., Coin, Snow. The list of names that Peeta recites yet the characters quickly move onto the next big thing. Bleh. One thing we all did agree on: we're sad that it's over. Here's to hoping Hollywood adapts more YA books! (On that note, expect a YA movie & TV news round-up soon. A round-up, that is, of all the movie & TV news I've announced in my bookish rounds posts these last six months). The above image was taken from Wikipedia for the purpose of critical commentary on the film per the stated copyright.